A gem of a village featuring the beautiful Portuguese coast, palm trees, fresh fish, sun, and a boardwalk stretching out for endless kilometres. A must-visit for any curious tourist! This route begins next to a beautiful Cascais bed and breakfast, whose architecture perfectly reflects Portuguese architecture, with roof tiles bordering the top of the structure. They also feature the typical blue and white tile art. Right in front of these houses is a ice-cream shop called "Santini" which is so famous that its lines usually extend to the outside, but it is definitely worth the wait. At the very heart of Cascais, your route begins, showing you through all the restaurant, shopping, and beach areas you will want to visit during your stay in Cascais. At Jardim Visconde da Luz you will find a very cute carousel for children. At this garden, every weekend, locals come together to sell things they have created or simply have at their home and no longer use. During the summer months these tables covered in red clothes extend for meters on end, and you can find anything from jewellery to old books and vinyl records. 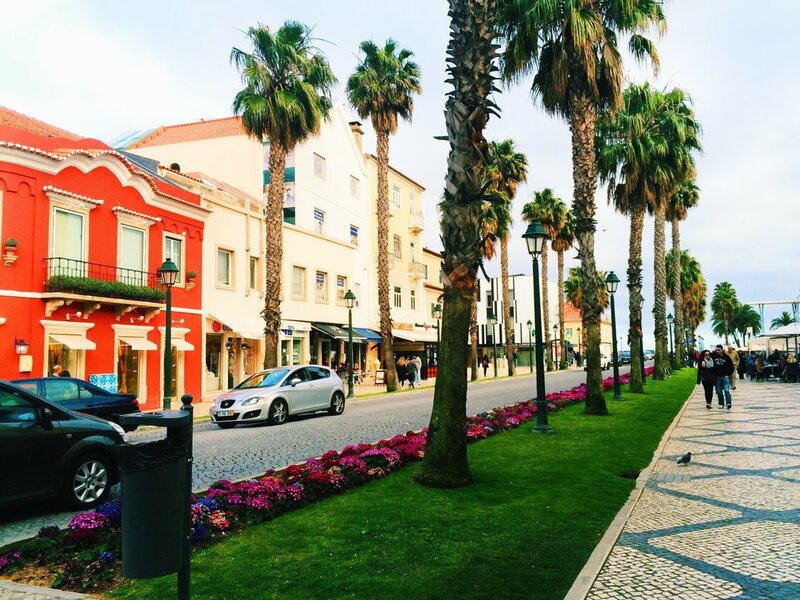 These beautiful palm trees welcome you to the heart of the Cascais village. To their right, there is a square full of typical restaurants which serve everything from the freshest fish to the richest meat. To the left, you will find the beginning of a very cute shopping street. Walking along the streets of Cascais is a joy to the eye of even the most accustomed visitors. As a local, this village never fails to mesmerise me. This street is the start of the restaurant area, which becomes a bar/club area at night, and many of these restaurants turn into dance floors. John Bull is one of the many restaurants in this square, and it has amazing fish. If you have never tried things like squid or octopus, I definitely recommend having your first time be at this restaurant. At the centre of this square of restaurants you will find a statue of Luis de Camões, considered to be the Portuguese language's greatest poet, often being compared to very big names in the world of poetry such as Shakespeare. He is most famous for The Lusiads. Further down, past the restaurant square, you will find the Cascais City Hall ("Camara Municipal de Cascais" in Portuguese) located in a square next to the ocean. The square features the typical Portuguese "calçada" the beautiful floor design that can be seen in this picture. The square, or "praça" is called "Praça 5 de Outubro" after the date of the establishment of the Portuguese Republic. A close-up picture will reveal the typical Portuguese tile artwork, often seen on traditional Portuguese houses and architecture, as well as the European Union flag, the Portuguese flag, as well as the Cascais Municipality flag. In the centre of this square, in front of the city hall, you will find a statue of Peter I of Portugal, better known as "the Just" or "the Cruel". His wife was assassinated and, as the legend goes, after he discovered the assassins, he ripped their hearts out with his own hands. Right in front of this square is one of Cascais' various beaches. This one is very small and serves mainly as a small impromptu port for fishermen, but is very attractive to tourists both in the summer months and otherwise. In this picture you can better see some of the fishing equipment. Right in front of the beach is one of Cascais' many hotels, Hotel Baia. This hotel is typically full year-round due to its strategic location and mesmerising see-view bedrooms. The beaches here are very clean and extremely kid friendly, especially because there are no waves year-round. Throughout the year, sand artists sculpt their artworks into the sand. You can toss a coin if you appreciate their work into the small plate in the centre. Sometimes they make sculptures with working water fountains. Located next to the beach are two other fancier hotels/restaurants, whose architecture reflects typical Portuguese architecture, with roof tiles bordering the top part of the structure of the house. Next to this beach is the "Doca Pesca" or Fishing Dock, where fishermen come to save some of their fishing equipment. Next to it is also the police station. Despite getting quite cloudy for a couple of minutes, Cascais is almost always cloud-free and sunny. This is a different view on the "palm tree street" that takes you to the restaurant square. Further down that street, across from the restaurants, you will find a small square that has a bunch of little stores that sell typical Portuguese broidery, scarfs, jewellery, towels, and much more! Very useful in the summer months, especially when you forget your beach towel at home. Here is a beautiful example of Portuguese tile artwork on houses. Yet another, but this one featuring orange tiles, which differ a little from the typical blue & white tiles. This small beach is one of Cascais' many hidden gems. Only accessible through two small flights of stairs, this tiny beach is an amazing place to relax and admire the view. Further down you will find the beginning of a never-ending, ocean-side boardwalk, which is perfect for jogging, walking, or cycling. This beach is the first of many beaches along the coast of Cascais, right next to bars and restaurants with amazing fresh fish. During the summer months finding free sand to lay your towel is almost impossible as this beach gets full of tourists. They also set up paddle-surf stands where you can rent paddle boards (which are great here because there are never waves), and a huge bouncy castle inside the water for children and adults to enjoy. All of these activities are closely monitored by life-guards. This beautiful building is located right next to the beach and was remodelled some years ago to serve as private accommodation. Here you can see the usual beach sports that are played throughout the year, including beach football and volleyball. This abandoned building is currently being auctioned, and rumours have it that they are planning to make it either a private home or a small hotel with an amazing view. It is one of the very first buildings you see along your walk on the boardwalk. You then run into Cappriciosa, an amazing Italian restaurant with very affordable food (everything from salads to pasta) and a breath-taking view, and it is usually full during the summer months so it is wise to make a reservation. Right beneath it is Artisani, an amazing home-made ice-cream shop featuring inside swings as seats. Amazing for children! Now that you've seen only some of what Cascais has to offer what are you waiting for? Come visit this beautiful ocean-side village!